All Applesauce pre-orders have shipped! If you pre-ordered an Applesauce, you should either have it or it is on the way to you. Thanks everyone for your support! Moving forward, we still have units in stock and are planning to keep them in stock and available for order. I am finally free to get back to working on the client software! Applesauce units to begin shipping next week! As many of you know, we have been waiting on some very specific USB cables which have been on backorder with DigiKey. Good news is they are in stock again and ours are going to be delivered on Tuesday! So, we can finally get the new units tested and shipped out starting next week! Just please remember that we are a small shop that are working on Applesauce after the day job. It may take a couple weeks to get everyone’s orders out the door, so please be patient just a bit longer. Thanks! Beta version of Applesauce software 1.1 is here! For those of you receiving your revision 1 Applesauce Upgrade boards, here is a client that will work with them. It is still in beta and I am working through some software bugs. The Disk Editor is currently disabled as I finish some work in there. This 1.1 client should work with the revision 0 Applesauce hardware, but testing hasn’t completed for that yet. This client will want to update to the new v2.0 firmware. Once that happens, the 1.0.x clients will no longer be able to talk to the Applesauce hardware. So, if it is urgent that your Applesauce be functional right now, I would recommend that you not upgrade to the 1.1 client until more testing occurs. A quick video showing the process of upgrading an original revision 0 Applesauce to the new revision 1 PCB. After a couple months of delays, the new run of Applesauce units are available for sale! 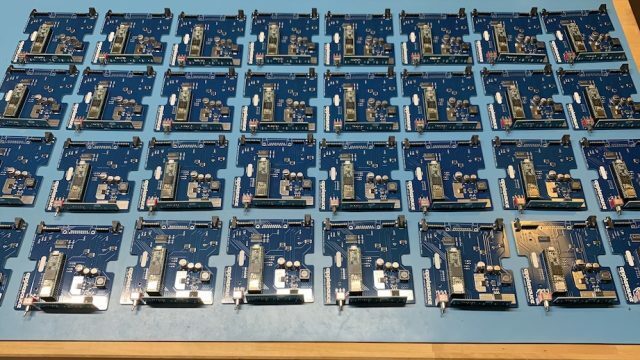 We have received our stock of boards and everything looks good to go! The price has gone up a bit since the last run due to the increased cost of the revision 1 boards and import fees. Head to the Order page if you need some gear. Applesauce is in production again! After many weeks of delays in getting test PCBs from the manufacturer, I received and was able to certify them this week. With this sign off, a new run of the Applesauce hardware has begun its manufacturing process. It will still be a few weeks till the PCBs arrive here for final assembly, but it is finally happening. The price will go up a bit from the initial run due to increased manufacturing and parts costs as well as new tariffs, but I won’t know the final pricing until the parts all get here. I am making 250 units for this run and currently have about 175 reserved by folks on the wait list. The new Applesauce hardware has several improvements and new features over the original. The power supply is more robust now. I have beefed up the output capabilities of the voltage regulators significantly to help it work with more drives that have drifted outside of their specifications over the last 35 years. The power supply also has a monitoring system so that it can now detect any abnormalities in power consumption and adjust imaging settings to compensate. This also allows for much greater diagnostic capabilities to ensure that your floppy drive is functioning properly and is a good candidate for disk imaging. If you purchased an Applesauce in the original run, I am having replacement PCBs made so that you can upgrade your units. There are no real improvements in regards to 5.25 drives, but I did find that many 3.5 drives require more power than what the original boards can provide reliably. So, if you have a Deluxe model, I strongly suggest that you upgrade your board. I will be making upgrade boards available as inexpensively as possible. The upgrade only needs a screwdriver, no soldering or other technical skills required. If you aren’t confident that you can do the upgrade, you can mail your unit back to me and I will replace the board for you at no additional charge. I’m also making extra sync sensors available for those of you that expressed interest in obtaining extras to install in a few drives. Applesauce 1.0.5 has been released! New disk visualization system. There is a new Visualize Disk option under the Tools menu. Better performance and the output file sizes are 30% of what they used to be. PNG files now also contain metadata. Fast Imager has undergone a significant upgrade. It will now allow for light copy protections, like volume number changes and E7 bitstream, to be imaged (WOZ only). Honors custom sector interleaves (WOZ only). Fixed issue with not always preserving the volume number on the disk in WOZ output. Fast Imager can now output .DO and .PO files with automatic detection of ProDOS disks. Disk Writer has been updated to also write .DO and .PO files. The underlying engine has also been improved to be able to write copy protected disks. Writing WOZ files is coming soon. Closing the Disk Editor window while analysis was taking place wasn’t properly terminating worker threads and freeing up memory. Added a Bulk Processor for rendering new PNGs for all of your .A2R files. Fixed UI issue in disk controller window when hiding and showing app. Wrote a brand new firmware updating system that fixes an issue with updates not working for some people. Firmware 1.02 adds better performance for some functions. Several more small fixes and crashes cleaned up. Applesauce Software v1.0.3 has been released! A new version of the software is now available. The primary focus of this build was cleaning up bugs in the UI and some functionality improvements. Better power management. Will only turn on power to floppy drive when needed. Will automatically turn off power after being idle for 3 minutes. Added cmd-i shortcut for the Image button on Fast and Flux imagers. Fast Disk Imager no longer saves files info a folder. Flux Imager metadata RAM Requirement now defaults to Unknown. New A2R format has been finalized. Applesauce will still open older A2R files. Bulk format updater coming soon. Flux Imager now correctly obtains write protect status based on actual disk. Fixed typo on MC3470 message box. Calibrate screen now turns off tests when switching to another screen. Metadata Inspector speed improvements. Changed Metadata Inspector shortcut to cmd-m. Disk Editor will enable Save and Save Rendering menu items only after work is completed. Disk Editor will now show bit timings across all reads. The alignment of nibbles still needs some work. Fixed bug where closing main window with unsaved data wasn’t actually closing window. Fixed delay when opening disk images via Finder. Added new Force Firmware Reflash window to recover Applesauce from failed firmware updates. Applesauce on the Assembly Lines podcast! Chris Torrence did a video on Applesauce for his Assembly Lines podcast while we were at KansasFest. I’m rambling as usual, but this time I am rambling with Apple ][ legend Roger Wagner! It was an honor to hang out with him and help save a box of his original floppies.